Inkjet devices continued to outperform laser devices and sales of consumer-targeted inkjets increased. In fact, sales of consumer printers during this part of Q4 2018 more than compensated for a double-digit decline (-13.9%) in sales of business-targeted models to drive overall imaging growth. Sales of multifunction printers (MFPs) were up by +5.4% year-on-year with continued growth for both inkjet and laser MFPs (sales were up by +5.8% and +3.2%, respectively). However, this was offset by the negative performance of single-function printers (SFPs): sales were down by -6.6% overall and -15.1% for inkjet SFPs. This pattern confirms that the shift from single – to multifunction devices continues. Sales of inkjet MFPs were better over these two months than in October and November 2017. Monochrome and A3 MFPs were still driving inkjet growth with sales +59.7% and +13.7% higher than the previous year. Entry-level ranges (priced up to €400) continued to lead sales of consumer-targeted MFPs, accounting for 99.9% of units and generating €68 million. Sales in the higher price bands of this level also grew significantly, up by +26.4% for €150–200 printers, +65.4% for those costing €200–300 and +51% for devices priced at €300–400. However, the greatest sales increase was in the €400–500 price band, which grew by +129.8% year-on-year. 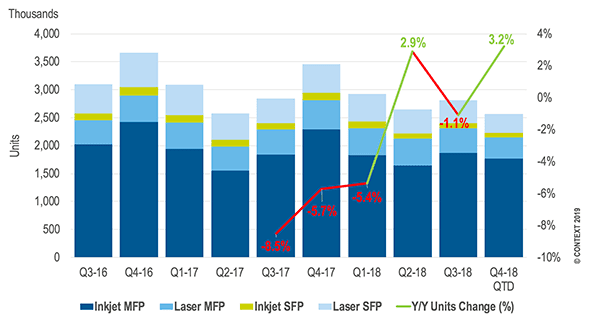 Laser MFP volume sales were up by +3.2% in the first two months of Q4 2018. The exceptional performance of consumer-targeted devices (sales up by +127.9%) was offset by a drop of -16.1% for the business-targeted models that account for 70.5% of laser MFP sales and 87.9% of revenue. Imaging sales and revenues for the first part of Q4 2018 grew in several WE countries, particularly Italy and the United Kingdom where there were double-digit increases in sales. Italy was also one of the only countries that saw growth in nearly every category (inkjet SFPs were the exception) and this was driven by the strong performance of Samsung (sales up +186.6% year-on-year), Canon (+21.2%), Kyocera (+14.6%), Xerox (+12.4%) and HP (+3.4%), which share over 70.2% of the country’s printer market. The increase in the United Kingdom was driven by the vendors which account for 81.4% of the British market: HP (sales up +72.1%), Canon (+43.7%) and Brother (+27.2%). But it was Belgium that registered the highest growth over this period – in terms of both units sold (up +46.3% year-on-year) and revenue (+42.4%) – with the increase driven by the three companies that dominate the country’s printer market: Samsung (sales up +354.8%), Epson (+209.8%), and HP (+23.8%) together hold a share of over 78.1%. Finland also registered double-digit growth in both measures (year-on-year unit sales up by +22.6% and revenue by +26.6%) with the increase driven by Samsung (sales up +334.7%) and Lexmark (+139.8%), which share almost 5% of the country’s printer market. What is the value of your trade association?